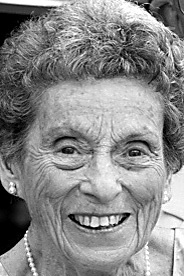 Joyce W. Gilliland, 87, a resident of Westminster Woods, Huntingdon, formerly of Tyrone, died Monday at Westminster Woods. She was born in Tyrone, daughter of the late Jesse J. and Ada J. (Rhodes) Woodring. On July 17, 1954, she married William Gilliland, and they celebrated their 64th anniversary last month. Surviving are her husband; a daughter, Susan (Robert) Weikert of York; a son, David Gilliland of Pittsburgh; a grandson, William (Molly) Weikert of Hollidaysburg; a granddaughter, Jill Weikert (Neal) Ballas of Chesapeake Beach, Md. ; and four great-grandchildren: Liam and Meghan Weikert and Miles and Eliza Ballas. She was preceded in death by a sister, Louise W. Latimer. Joyce was a 1953 graduate of Tyrone High School, and, in 1953, she graduated from Philipsburg State Hospital School of Nursing. She was employed as a registered nurse in various positions until 1980. She was a lifelong member of Tyrone First Presbyterian Church, a former Girl Scout troop leader, a member of the Daughters of the American Revolution, a past president of the Young Women’s Club and a member of Presbyterian Mariners. Joyce was an avid quilter and could often be seen on her tandem bicycle with her husband, riding around Tyrone. They both enjoyed traveling the world and visited 48 states and 57 countries. She also enjoyed reading and watching backyard wildlife. A memorial service will be held at 2 p.m. Friday, Aug. 31, 2018, at First Presbyterian Church, Tyrone, Pastors Mark Liller and Brett Hoover officiating. After the service, a fellowship time and dinner will be held in the church social hall. In­urn­ment will be at Grays­ville Cemetery. Arrange­ments are by Derman Funer­al Home Inc., Tyrone. In lieu of flowers, memorial donations in Joyce’s memory may be made to Tyrone-Snyder Public Library, 1000 Pennsylvania Ave., Tyrone, PA 16686, or to Friends of Westminster Woods, 360 Westminster Drive, Huntingdon, PA 16652.